John Lee Armstrong, who coached and taught at Samford University for 32 years and posted the second highest football winning percentage in school history, died Nov. 1 in Birmingham. He was 79. 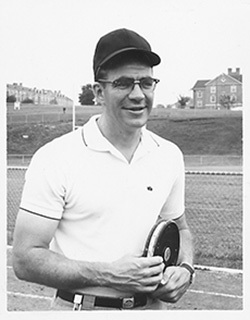 Armstrong played football and baseball at Samford during the early 1950s before earning his degree in 1954. After coaching in Jefferson County high school ranks, he was named head football coach at Samford in 1966. He posted a record of 20 wins, nine losses and two ties over three seasons, a winning percentage of .677. Armstrong returned to high school coaching for several years before rejoining the Samford faculty in 1978 as assistant professor of health, physical education and recreation (later exercise science and sports medicine). He retired in 2006. He served as president of the Kenny Morgan Scholarship Foundation Executive Committee, which raises scholarship funds for Samford students. In addition to his Samford tenure, Armstrong coached and taught at Fairfield, Woodlawn and Erwin high schools in Jefferson County. He was Jefferson County Coach of the Year in 1976-77. He is survived by his wife, JoAnn; sons Johnny, Jimmy and Jeff; daughter Joy Barber; nine grandchildren and six great grandchildren. Services for Armstrong will be Saturday, Nov. 3, at 12 noon at Jefferson Memorial Funeral Home in Birmingham. His family suggests memorial contributions to the John Lee Armstrong Scholarship Foundation at Samford.